Where required, the video capture of your drone can be inverted or flipped, essentially making the sky on the bottom and the ground at the top of recorded images. With all the bangs and bumps a drone takes, sometimes it needs a little tune up to keep it in the best running condition. If your drone is off centre and is slowly drifting to one side when it is supposed to be stationary for example, you may need to calibrate the internal gyroscope. To do this, simply place the drone on a flat level surface. Turn the drone ON then press the gyroscope calibration button. This will reset and equalise all the sensors (so to speak), to give your drone the best chance at optimal flying control again. 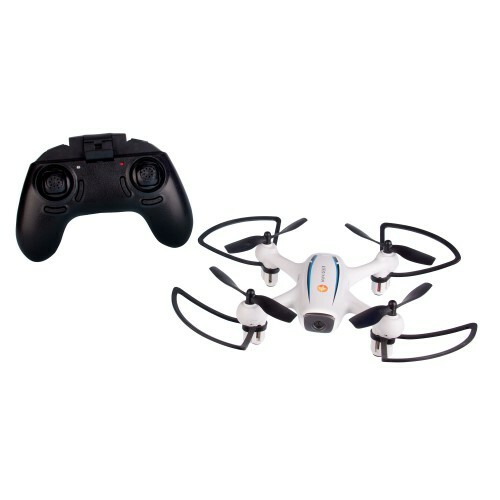 Loaded with all the latest features such as 6 axis gyro, one-touch 360 tricks, 2.4GHz remote and headless mode; for those just starting out, the WF20 also has extra WiFi and follow flight path smarts. With one-touch take off and landings and voice commands, leave some of the hard stuff for your Drone to manage, while you sit back and enjoy your flight using your "First Person View" (FPV) footage being streamed directly to your portable smart device.